I think some of you may had read this before but its great to read it and be reminded again. 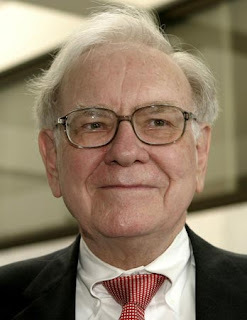 I personally find Warren Buffet, the second richest man who has donated $31 billion to charity, a man with great integrity and there are so much that we can learn from him. Below are some of the interesting aspects of his life that was gathered during an interview on CNBC. got married 50 years ago. He says that he has everything he needs in that house. His house does not have a wall or a fence. - Rule number 1: do not lose any of your share holder's money. - Rule number 2: Do not forget rule number 1. C. Don't do what others say, just listen them, but do what you feel good. D. Don't go on brand name; just wear those things in which u feel comfortable. E. Don't waste your money on unnecessary things; just spend on them who really in need rather. F. After all it's your life then why give chance to others to rule our life."